Diaper Cakes make the perfect practical gift for the expectant mom, or a whimsical decoration to anyone’s baby shower! 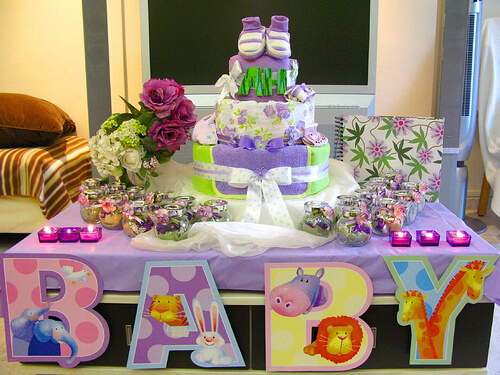 Place the Diaper Cake center stage on a beautiful decorated table, surrounded by candles, flowers, cupcakes and candies. A table of festive treats will enhance your table. The baby rattle cupcakes are easy and a sweet addition to the celebrations. All of La Bella Baskets diaper cakes come equipped with plenty of cute items for the new baby. The best part is that every item is useful and intended to make mommy and daddy’s time with baby much more enjoyable! These make great gifts and adorable centerpieces for baby showers. More cute baby shower gift ideas here. We even have personalized gifts too! Ask me how to save 20% on your order. Other Great Baby Shower Gifts Ideas! Next ›August Gift Basket Giveaway Winner!